Posted on 15, November 2018 by EuropaWire PR Editors | This entry was posted in France, Science, Technology and tagged AI, AI-augmented simulation, artificial-intelligence, Atos, BullSequana XH2000, hybrid supercomputer, Pierre BARNABÉ, simulations, supercomputer. Bookmark the permalink. 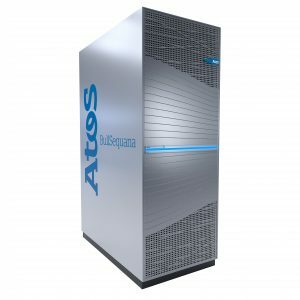 PARIS, 15-Nov-2018 — /EuropaWire/ — Atos, a global leader in digital transformation, today announces the BullSequana XH2000, the company’s most efficient supercomputer. The BullSequana XH2000 is a hybrid supercomputer and responds to today’s demand for a high-performance computing power which can orchestrate workloads between on-premises, public and private Cloud environments, enabling businesses to benefit from optimum flexibility, efficiency and performance. The BullSequana XH2000 can handle converged workloads simultaneously (HPC simulation, Artificial Intelligence, Deep Learning) on the same one machine, at the same time to enable organizations to overcome the limits of traditional simulations and explore new applications, accelerating business transformation and innovation. As workloads expand to include AI, businesses need more computing power, and the BullSequana XH2000 provides this in a system that supports the latest CPU and GPU processor and accelerator architectures, including Marvell ThunderX2® Arm®, NVIDIA Volta V100, Intel® Xeon® processors and the latest AMD® EPYC Rome, for ultimate power, speed and accuracy. This is the first Atos supercomputer that supports AMD processors. The BullSequana XH2000 allows a choice of system interconnect technologies, including InfiniBand HDR and BXI (Bull eXascale Interconnect) and Fast Ethernet. The BullSequana XH2000 is futureproof and completely scalable. Its Open Sequana architecture makes it fully compatible with future computing blade and interconnect technologies, so that businesses can easily upgrade the system. It is exascale-ready, capable of processing an exaflop (a billion billion operations per second) by 2020. The BullSequana XH2000 consumes less energy than current systems. It is 100% water-cooled using Atos’ patented DLC (Direct Liquid Cooling) solution, which minimizes global energy consumption by using warm water up to 40°C. “With this announcement, the Atos Group confirms its strategic commitment to providing high-computing power to research centers and enterprises to carry out their research projects and to support their need for innovation.” says Pierre Barnabé, Chief Operating Officer, Big Data & Security at Atos. The BullSequana XH2000 is available from February 2019. Atos is at SC’18, the High Performance Annual Conference that takes place in Dallas, Texas, from 11-16 November, and will exhibit the full breadth of its High Performance Computing offer on booth #2213. Atos is a global leader in digital transformation with 120,000 employees in 73 countries and annual revenue of € 13 billion. European number one in Cloud, Cybersecurity and High-Performance Computing, the Group provides end-to-end Orchestrated Hybrid Cloud, Big Data, Business Applications and Digital Workplace solutions through its Digital Transformation Factory, as well as transactional services through Worldline, the European leader in the payment industry. With its cutting-edge technologies and industry knowledge, Atos supports the digital transformation of its clients across all business sectors. The Group is the Worldwide Information Technology Partner for the Olympic & Paralympic Games and operates under the brands Atos, Atos Syntel, Unify and Worldline. Atos is listed on the CAC40 Paris stock index.